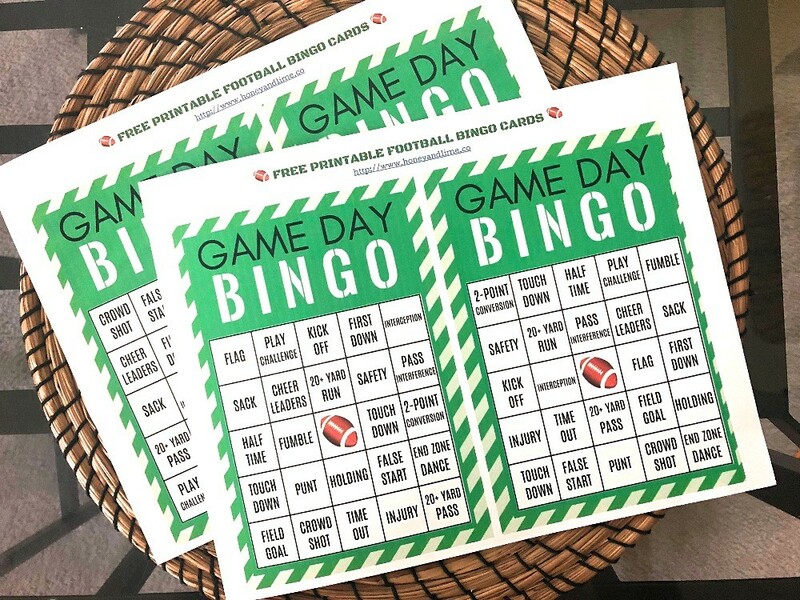 Liven up your football parties with these free printable football bingo cards! 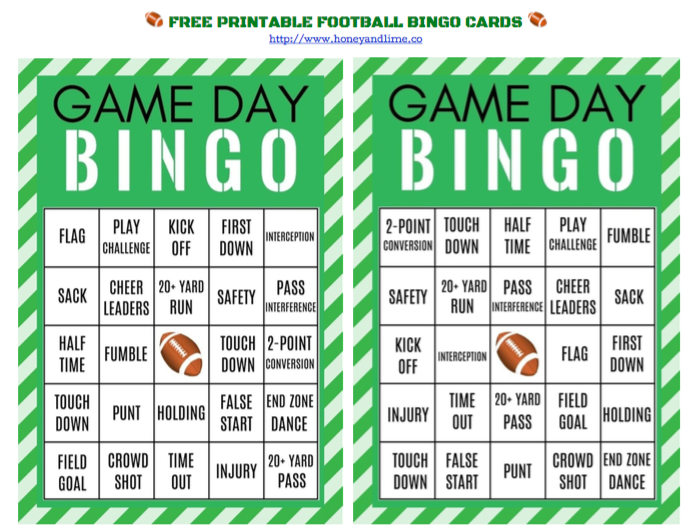 If you are looking for game day party ideas, this fun football party bingo game is perfect! Football fans, unite! Football season is one of the best times of the year for sports fans! Both college and NFL games are fun to watch with family and friends, all while you root for your favorite team. I have two family members that played in the NFL, so you can bet that our family enjoys the game. 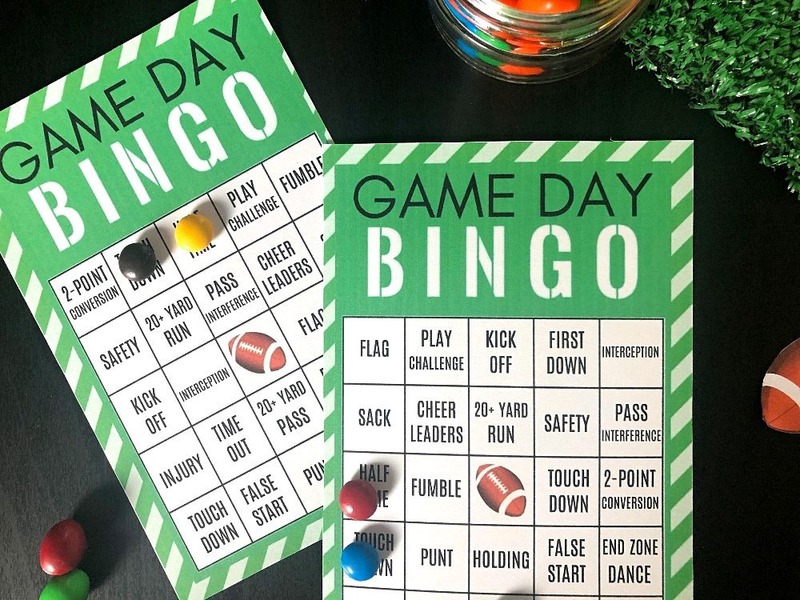 The playoffs and Super Bowl Sunday are the best times to watch together, so if you’re planning a game day party, these free printable football bingo cards are perfect for both kids and adults in attendance! Ok, so this football bingo game is a lot of fun with a large group! Print out the free printable BINGO game day cards PDF as many times as you need to for the amount of people you expect to play. This is a set of 4 cards so do the math and get to printing! 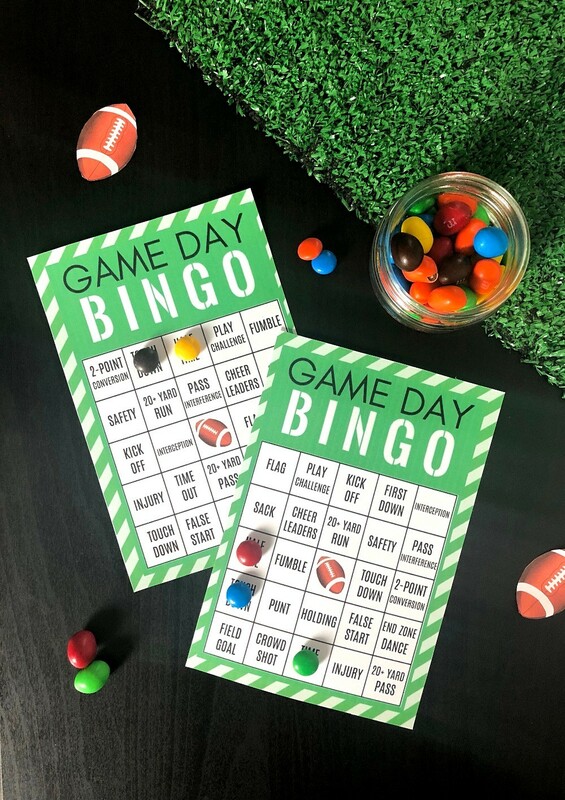 Cut out each printable game day bingo card, shuffle, and hand them out at random, along with a M&M candies fun-size pack as bingo card markers. Before the game starts, explain to guests that you’ll be playing bingo while watching the game. The football in the center of the card is your free space. As the football game commences, there will inevitably be a kick off, a field goal, some touch downs, a flag, a fumble, etc. Players should place a candy on the corresponding box as it happens in the game. 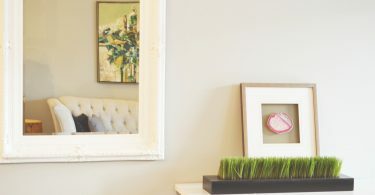 You can choose how you want to select winners in advance. It could be one rows/column filled, an X on the football bingo card, or even a black out, or filling up the whole card. I play black out so the game lasts a little longer, but it’s totally up to you! I hope you love these football themed bingo cards! These are totally perfect to use as Super Bowl bingo cards, they make a really fun football party bingo game! 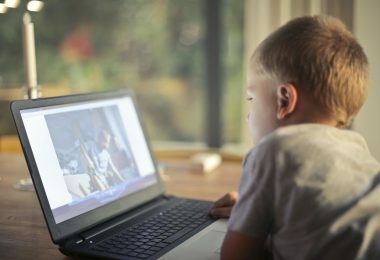 This game is pretty easy, as I wanted it to be something that both kids and adults could play together. I chose common football calls and actions, so there’s no off the wall stuff that doesn’t happen too often in games (lateral/backward passes, hail Mary pass, an all-out brawl, etc). These free printable football bingo cards are not specific to any one team, so have fun, and GO TEAM! 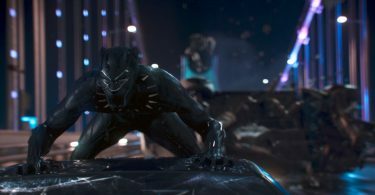 Black Panther is Going To Be HUGE – And I’ll Be At The Black Panther Movie Premiere in Los Angeles, CA!